← How to get bins or trays from a printer and change bin or tray for PDF Printing? It looked like in your knowledgebase someone else had a similar question, so If it can be done I would be very interested in purchasing your product. Enclosed is a copy of our PCL file and how the first few pages should be created in the PDF. Thank you for the response. 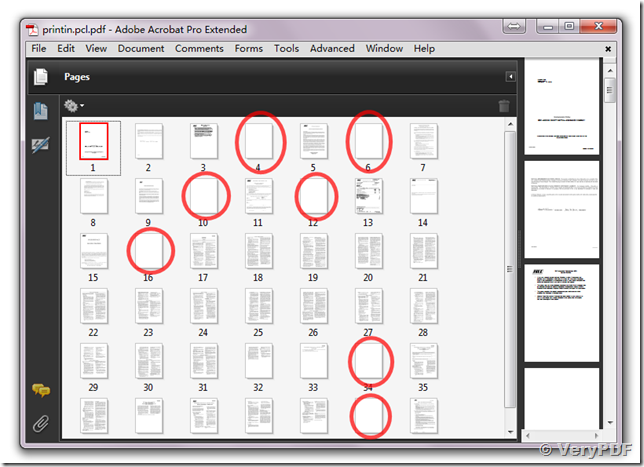 I viewed the PDF file you generated and there is one problem. Page 37 which begins with the title 'NO SECTION II - LIABILITY COVERAGE FOR' should have had a blank page inserted after it. So the total number of pages of the document should have been 46. If this is something you can fix could we obtain a trial license of this custom built version? Even if it is for a limited amount of time (7- 10 days) The reason being is that we would need to test it on much larger PCL files so we could feel comfortable with this software before we purchase the full license. One last thing, is it possible on the blank pages to insert a fixed message in the middle of the page? We'll give you the message later if the trial works out and we purchase the license. We have a PCL file that we want to convert to PDF but preserve the simplex and duplex of the PCL, so the PDF should insert blank pages where appropriate. The first time I submitted a PCL file it worked except for one page. In the ticket you were offering to update your software to accommodate our PCL file but we think we might have found an issue on our end with the PCL file. So we would like to resubmit the updated PCL and have you generate the PDF again with the corresponding simplex and duplexing and see what the results look like. I have attached the updated PCL file. Thanks for your message, this problem has been fixed in the latest version of PCL to PDF Converter software. "-multiduplex" parameter is work fine to convert your PCL file to PDF file now. pcltool.exe -$ XXXXXXXXXXXX -multiduplex -pclcmd "\"-J@PJL SET PAPER=Letter\"" "D:\FIRE_13_DFC_4_1781672_DEC_1IN.PCL" "FIRE_13_DFC_4_1781672_DEC_1IN.pdf"
pcltool.exe -$ XXXXXXXXXXXX -multiduplex -pclcmd "\"-J@PJL SET PAPER=Letter\"" "D:\10042_HOME_1_HOC_1_1636330_DEC_7IN.PCL" "D:\10042_HOME_1_HOC_1_1636330_DEC_7IN.pdf"
pcltool.exe -$ XXXXXXXXXXXX -multiduplex -pclcmd "\"-J@PJL SET PAPER=Letter\"" "D:\4978220_AUTO_1_PAC_1_1671899_DEC_3IN.PCL" "D:\4978220_AUTO_1_PAC_1_1671899_DEC_3IN.pdf"
pcltool.exe -$ XXXXXXXXXXXX -multiduplex -pclcmd "\"-J@PJL SET PAPER=Letter\"" "D:\printin.pcl" "D:\printin.pcl.pdf"
I am working for medical equipments where we use HP printers. Our machine is default set on PCL3 Gui language supported printers which are no more available in market easily. Can you please help me how can i find PCL3 gui supported printer in Dubai?